All woods have undertones. Oak has yellow undertones that we need to be aware of. If you want your cabinets to ‘pop’ off the wall, then I would suggest a blue or violet color which is the complimentary (across the color wheel) color of yellow. But most people do not want their cabinets as the main focus of the kitchen. As I posted in my blog Best Wall Colors for Stained Trim , I typically do not like to suggest using a white paint with lighter wood cabinets for a few reasons. One-white has different undertones that do not always work with the yellow wood. Secondly, I personally do not like the look with no contrast since it looks a little too pale for me. 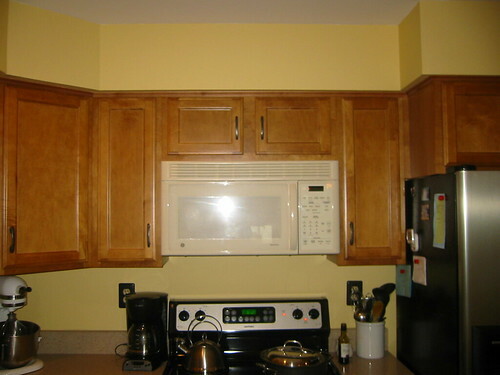 Yellow seem to be the color of choice for many people that have lighter wood cabinets. Yellow might work but my but only concern with yellow is that this color doesn’t really create any personality in the room. Without any contrast, the room tends to look a bit too boring for my taste. So, what is my suggestion for a wall color when you have oak/light cabinets? So green is my first choice when looking for a great color to work with oak or light wood cabinets. My color advice is based on working with oak cabinets. The floors or countertops were not taken into consideration for this example. Do you agree green is the best color for kitchens with oak cabinets? I also like a few terra cotta colors but that is for another day! Comments? 1/2015 New: Here is a link to a new kitchen design with oak cabinets, here. You can see more color ideas here. If you need help choosing the perfect paint color for your home, contact me today. I just put in the black granite with my oak cabinets, and it looks fantastic! I’d thought about staining them darker but decided against it. VERY GLAD I DID!! I couldn’t decide on a gray or green paint, so I chose one called Anonymous. It’s got gray and green tones to it depending on the light. Thanks for your blog!!! It helped so much! Thanks for making my day Christine! Anonymous from SW or Benj Moore? thanks! Would you have a picture to share? Amy, Anonymous from SW. You can find photos on Houzz.com or Pinterest.com. Thanks for writing! Love your blog! Need help. Just moved into a home that has been completely renovated, although not my choice. We have refinished golden oak cabinets, venetian gold granite, large blue/gray slate tile back splash with blue/gray vinyl floor. Too much to change, so kitchen will not be redone for a couple of years. I love the green idea but afraid it will clash with tile, etc. Any color suggestions? Thanks! Thanks for the help! I want custom cabinets in New York and was thinking oak, but I didn’t know how much they went with. They can actually go with a lot, who knew? Lovely colours, the blue and light oak looks really good with eachother! What color green is in picture #8? I have the golden color stained oak cabinets and was thing of a going to a red or green..
What to do with honey oak cabinets and deep dark green countertops? Did you take a look at Ben Moore Agave AF-420. This green works beautiful with oak wood. I have med. oak cabinets, colbalt blue back splash, and white counter tops. What color would work well on the walls? We just ordered oak shaker cabinets and the color is not red-golden, rather a slight green tinge, in my opinion. What color should I paint my walls in this case? Hi, Kelly! I am loving the Ben Moore Agave green, and I’m planning to paint my kitchen, dining, and living room soon. I have a home built in the 50s and all of the cabinets and trim are honey oak. My husband doesn’t want me to paint the cabinets or trim, and I’d been having a lot of trouble choosing a wall color to work with the wood floors and trim. (For a while, I had about 40 paint swatches attached to the wall as I tried to decide!….lol) The photos are what sold me on this color. I wish you’d post some photos of living rooms with wood trim, wood floors, and green walls. I’m trying to choose accent colors, etc. I love your suggestions and your site! Thanks for you comments. I am getting ready to repaint my kitchen, which is now red and I love it, but it’s been up a while and my kitchen just needs a refreshing color. My cabinets are oak and I love them, so painting the walls was my solution. I love the greens and was considering it, but after seeing your photos, it’s the color I’m going with!! I have oak cabinets w dark brown granite counters tops. I have yellow now and I’m sick of it. Any suggestions??? We have a deep red wall color with golden oak cabinets and a light colored counter top. We are changing the white appliances to stainless steel. One wall in the kitchen is the green color you have above. What color counter top should we go with? Thanks for your help! Hi Caron. I would go with a black countertop. It will update the kitchen especially with the stainless steel appliances. Good luck! can I use oak baseboards next to dark brown flooring? Looking for the color number in the very first picture at the top it looks like a grey/green with the oak cabinets. Thanks. Thanks for this little guide! The green would certainly be a daring choice! What color is the green in the top picture for the kitchen? I tried tracking the color back- could not find. Hard to guess a color, especially a computer picture. It looks like it is near BM Fresh Olive 2149-30. I have honey oak cabinets and planning a remodel. The new kitchen will have a brick wall. The Firenze matches the brick perfectly, but I really love how the agave looks next to the cabinets. I really love the orange colors, but the green will bring the outdoors in since we are surrounded by trees with lots of greenery. I can’t make up my mind. What color countertops will look good with the green & ditto for the terra cotta? Hi Sue, Hard to answer color question about countertops because there are so many different colors. As a rule of thumb, the Firenze would look best with a cream background color. The Agave would look best with a white background- crisp and clean. Hope this helps. There are many, many shades of blue out there! It would be impossible for me to choose the right blue color for you without seeing your room, your new backsplash, etc. Send me an email if you would like to work together. I have cabinets in my new home that are similar to the ones listed. They have an orange undertone to them. Across from the kitchen is a formal dining room that has a greyish black stacked stone fireplace with the same oak color mantle and base border. my question is how would I bring the browns and greys together with countertops, décor, wall color? The ZAPC painters located in DBN helped refining the old home, and provided it a modern look. You can rely on them for all wall painting needs. I have oak cabinets which I can’t change. I am going to paint my kitchen and change counter tops. I am looking for flooring ideas for a kitchen with honey oak cabinets, black counter tops and white appliances. I really don’t want to go with the wood like laminates as we have hardwood through out the rest of the house. I need coloring thoughts? Light/dark?? Sheet vinyl?? Thanks! We have honey oak cabinets with yellow/orange tones, we have a backsplash with multi colored green tiles,meaning from blue/sages/olive .. Get the picture….. The tiles are light tan and all the wood work will be white. The green tiles are the stumbling block. This room does get a lot of light during the day. I meant to say the floor tiles are a tan color and the countertops are white coriander. I do not want to spend a fortune, just update it. I am looking for some kitchen/dining room wall color advice. I have honey oak cabinets with a medium blue counter top and have just installed a varied brown floor tile. What colors would go with all of this? The second blue isn’t as nice because, I think, the values of the cabinets and wall are too similar.